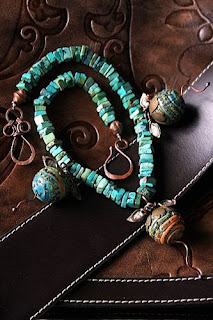 I have mentioned before that if I had my wish, I'd just give my beads away-- that the real joy is in the envisioning, crafting and sharing, not in the selling. But there are electric bills to pay, supplies to buy, and a very tiny bit to Etsy, that wonderful site for all things handmade that allows me to share my work with folks all over the planet. Writing my blog is my way of sharing the pleasure I get from creating and how it is that I do create. That's the gift I have to give and so far, I'm gratified to say that it's been well received. But in order to share the information, people have to read my blog--so publicity has its place in the grand scheme of things. Many of my fellow artists have been more than generous in talking about my blog and my work and in this season of thanksgiving and celebration, my thanks goes out to all of you who have made this possible! 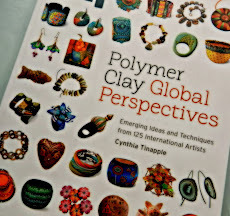 And thanks to my family as well, who have supported my artistic endeavors since I first held a crayon or burned my first polymer clay bead in the toaster oven. So now my little offerings are out in the world, in a big way--and their success is part of a collaboration with all of you in many ways. 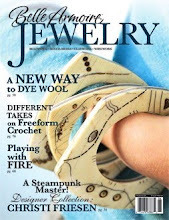 First, I got news last week from Interweave Press that my first solo piece, a necklace, had been accepted for Stringing Magazine. 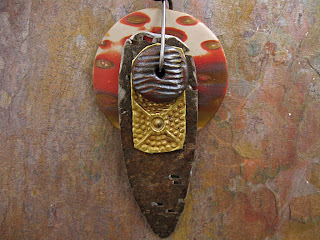 With beads from Barbara Lewis and clasps by Cindy Wimmer, “Reading the Stones” will debut in the Spring 2010 issue. I can't show you a photo but I think you'll like it-- I'm proud that I stayed true to my style and found a way to use some friends' work in it as well. 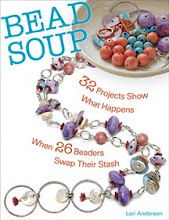 After keeping the good news secret for months, Bead Star 2009 should be on the newsstands this week and Lorelei Eurto's necklace “Claude's Lily Garden” won 3rd place in the Plastics category with my Apocalypto beads featured as her focals. 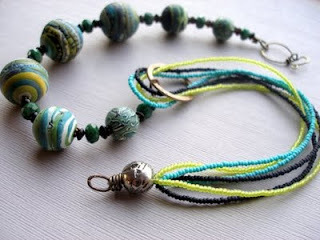 Lorelei has been a big supporter of my work since the beginning-- she used my Little Bumblebeads in her The Convertible necklace that was published in The Best of Stringing a few months ago. 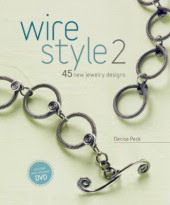 See more of her excellent design work on the cover and in the pages of Jane Dickerson's newly published book Chain Style. Another person I owe a great “thank-you” to-- as much for moral support and advice as for showcasing much of my work is the generous and talented Deryn Mentock. She encouraged me early on to write a blog-- I was waiting until my retirement next year-- and through writing the blog I discovered my true purpose-- to share with others what I've learned about artistic process and manifesting your creative vision. So Stories They Tell is out in the world. I encourage you to celebrate with me the enormous blessing of self-expression by whatever technique you love best. This is truly the thing that we should give thanks for. And for good artist friends everywhere. And I am also truly thankful for the connections I have made through blogging - that I would never have made otherwise. There is much to be thankful for! Christine...I think 2010 is going to be an incredible year for Stories They Tell! I am really happy for you that your beautiful necklace will be featured in Stringing...and I cannot wait until that issue comes out. 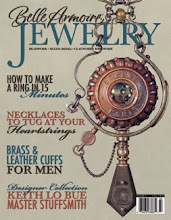 And speaking of publications..I picked up Bead Star today! 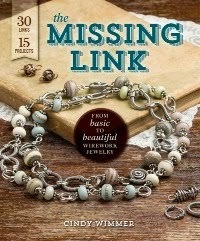 I just had to see your beads "in print" as well as the work of our fellow jewelry designer friends. I'm thankful to be a part of this community too. And I'm sure glad Deryn encouraged you to start your blog way back when...it's a bright star in the blogland sky! That is wonderful news, I can't wait for the next Stringing issue, your work is beautiful! Congrats! Your work is so lovely! You deserve all the recongition you receive, you earned it! Can't wait to see your project in Stringing Mag. Congratulations! 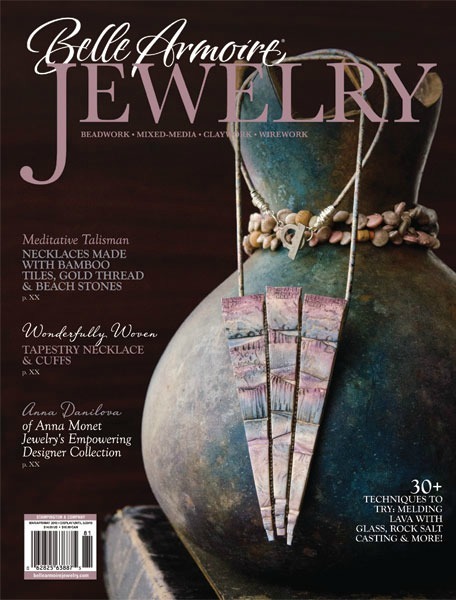 I am looking forward to seeing "Reading the Stones" in the spring issue. Christine, your talent doesn't need any encouragement to shine through...it just does! I'm so glad you started this blog so we can all see! So it is you who is bringing me fame and fortune! 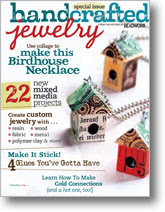 Got an email from Interweave saying that I would be listed in the Resource Section of Stringing because "someone" used a bead in a piece that will be in the Spring Issue. Congratulations, Christine! Beautiful work! It just keeps getting more better!